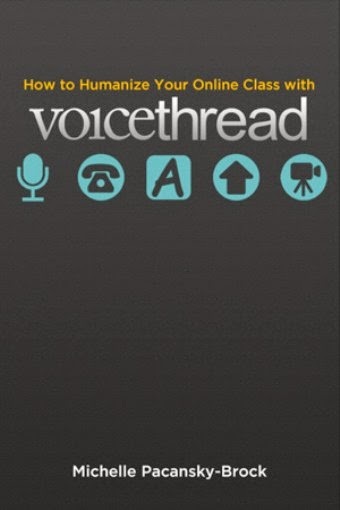 I am participating in a TLT Group book discussion around Michelle Pacansky-Brock's book, "How to Humanize Your Online Class with VoiceThread. The discussion is taking place using VoiceThread. Create different identities such as one for when I am when I am inserting a text transcript of my voice comment and one for when I am providing feedback. Survey students at the beginning of class regarding the the method they plan to use for creating a voice comment: mic, webcam, mobile app, phone. A low risk ice breaker at the beginning of class which requires the use of voice. It looks like there is a way to use the Doodle tool so that it does not fade away. I want to experiment with that. I'd also like to experiment with uploading a video into VoiceThread and using the Doodle Tool to comment. I'd like to experiment more with leaving VoiceThread comments using a mobile device. I would like to better understand Voice Manager. I would like to create/adapt some collaborate learning activities using VoiceThread with some of my content. I would like to further explore the various ways we, as teachers, can and should construct our presence online. Instead of using a survey regarding the up-coming TLT Cognitive Science Book Discussion Series, I would like to create a VoiceThread as a way for members to react to the books and talk about how they may want to contribute to the discussions.